Although Delta blues is the centerpiece of Clarksdale's Sunflower River Blues Festival, it's also been a showcase for North Mississippi Hill Country Blues and Bentonia-style blues, says Melvita Tillis Presley, festival chair and daughter of the late blues historian Melville Tillis. Beating a tribal cadence for Hill Country blues through the decades have been two generations of the Rising Star Drum and Fife Band led by Othar Turner, his daughter, Bernice, and granddaughter, Sharde Thomas. Other Hill Country celebrities performing during the Sunflower's 30 plus years include R. L. Burnside, Junior Kimbrough, Robert "Wolfman" Belfour, Jessie Mae Hemphill, the North Mississippi Allstars, Lightnin' Malcolm, Kenny Brown, and other generations of Burnsides and Kimbroughs. Although Skip James is given credit for championing Henry Stuckey's Bentonia-style Blues, Sunflower Festival fans heard it at the first festival in 1988 via guitarist Jack Owens and blind harmonica master Bud Spires. 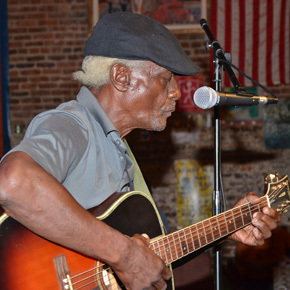 Today's leader of the Bentonia-style blues is Jimmy "Duck" Holmes, who stages the Bentonia Blues Festival and the Blue Front Café in Yazoo County. "I learned to play from Henry Stuckey when I was 10 years old; he planted the seed, and I've been playing all my life," says Holmes speaking from his home in Bentonia. Holmes has just returned from Vancouver, Canada, and Port Townsend, Washington, where he led a workshop on Bentonia blues. Asked to describe its style, Holmes said many of the lyrics have a sad melancholy mindset, although some are upbeat like: "My baby's coming back." "It does not have a dominant drum beat like Hill Country Blues," he said. Holmes said he used to visit daily with Jack Owens before the guitarist's death, and he enjoys welcoming visitors to see him every day in Bentonia although the Blue Front Café no longer serves food except for special occasions. "Visiting with blues fans is one of my rewards," says Holmes, who has bookings on the west coast and Nashville through September and October. Asked also about his nickname "Duck," the musician said friends started calling him "Duck" when he was five or six years old. He never had a pet duck. Retired educator John Holmes who instructs students in Clarksdale's Delta Blues Museum's after school music education, program is his brother, and the late Mary Holmes Towner, mother of Coahoma Community College's president, Dr. Valmadge Towner, was his sister. "Our mother came from the Delta, moved to Bentonia following the 1927 Mississippi River flood, and never went back", he said. "John likes Chicago blues." 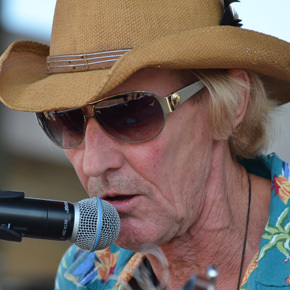 When Holmes took the acoustic stage at last year's Sunflower Fest, he was greeted with reverence and a standing ovation from fans. The Bentonia musician will be performing at 1 p.m. Saturday, August 11, at Ground Zero Blues Club. At age nine, North Mississippi Hill Country Blues master Kenny Brown was learning to play guitar under the paternal guidance of blues pioneer Joe Callicott of Nesbit. Calicott died when Kenny was 15, but legendary guitarist R. L. Burnside continued the lessons with a distinctive style of his own. Asked when he first started performing, Brown figures he was 10 when he played in a juke joint with Burnside. Decades later the tall lanky musician just back from solo tours in the cognac region of France, says he enjoys playing country standards like "Drop Down Baby," and classics written by Joe Callicott and Fred McDowell. And although he loved the French lifestyle with multiple gourmet multi-course meals and wine every three hours, he's happy to be back home now a few pounds heavier. Home includes horses and dogs, and it's out in the country from Holly Springs. Popular abroad at festivals in Italy and Norway, Kenny was greeted last year in Notodden, Norway, Clarksdale's blues sister city, with an oversize photograph of himself and Morgan Freeman welcoming visitors to their new European Blues Center. Brown has lost track of how the many times he has been featured at the Sunflower Festival. One of the first was inside the Delta Blues Museum when it was on the second floor of Carnegie Public Library. This year he will be playing at 3 p.m. Saturday, Aug. 11, inside air-conditioned Levon's Bar and Grill on Sunflower Ave. Admission is free. 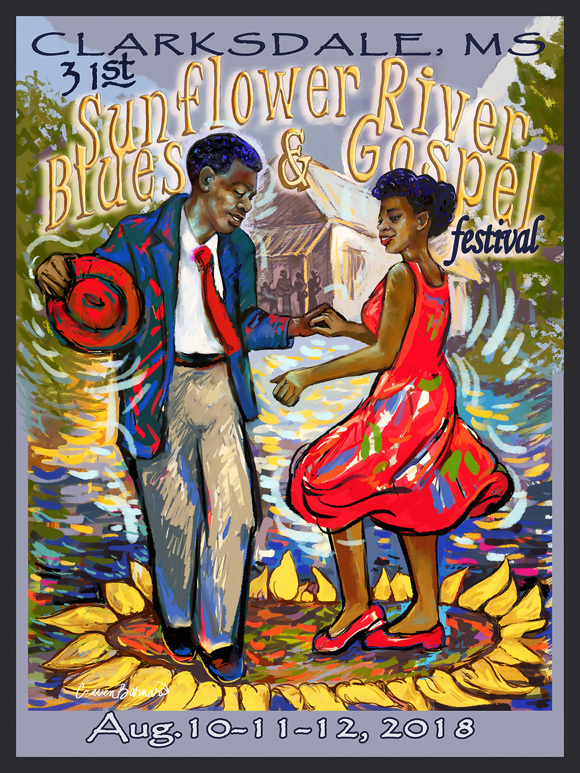 The Sunflower kicks off in downtown Clarksdale at 6 p.m. Friday, Aug. 10, and continues through its gospel component Sunday Aug. 12. The gospel celebration is being filmed by the Matador Network and Visit Mississippi for a travel video for the state of Mississippi.